Originally published in Japanese in 2000, this book captures the spirit of “International Convention on the Elimination of All Forms of Discrimination Against Women” in easy-to-understand English. 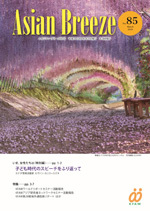 Why don't you read Asian Breeze? Kitakyushu Forum on Asian Women (hereinafter, “KFAW”) manages and operates the KFAW Website and a website of the Kitakyushu Municipal Gender Equality Center (hereinafter, ”Move”) properly and safely and uses records of IP addresses and cookie function to improve its services.